Strawberries feature a lot in desserts. Whole, cut or pureed. The taste of strawberries can range from sweetness to slightly acidic. Orginally grown only in Europe, nowadays strawberries are grown all over the world. Strawberries are an excellent source of Vitamin C. It also contains Vitamin B complex, Vitamin A and minerals like potassium, manganese, copper, iron, fluorine and iodine. When I was in Bangalore in March this year, I couldn’t resist the temptation to buy loads of nice juicy strawberries to eat on its own or for desserts. In India strawberries are mainly grown in Mahabaleshwar. The first time I saw them some years back in the Juhu market I thought they were imported, but the fruit vendor assured me they were very much grown in India. I made strawberry sauce to serve with vanilla ice cream. Trim and hull the strawberries. Cut them into half or quarter depending on the size. Mix the cornflour in about 2 tbsps of water and keep on the side. Put the strawberries and sugar in a pan over low heat. Cook and stir the strawberries till the mixture becomes watery. When it begins to boil, add the cornflour mixture and stir constantly. Cook for a minute or two. it will thicken a bit. Take the pan off the heat. Add lemon juice and mix well. Let it cool before using. The sauce keeps well in the refrigerator for a week. Serve it with ice cream, pancakes, waffles, fresh fruit or with cheesecake. 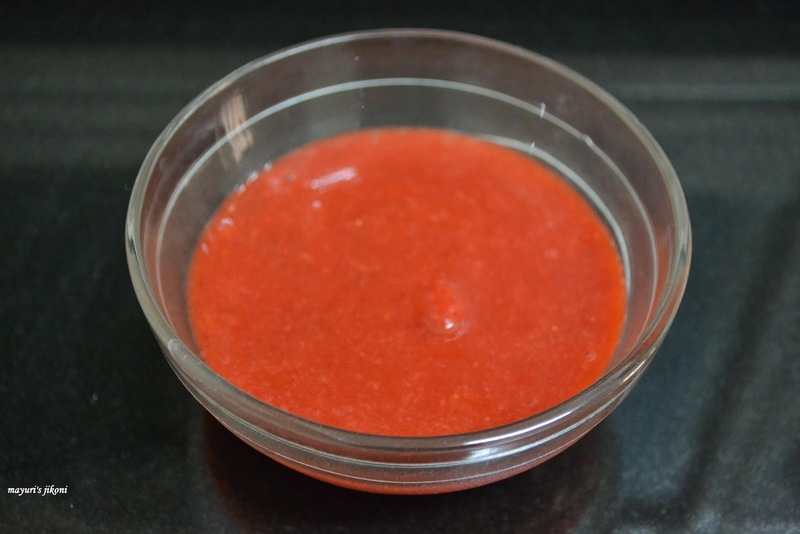 Try making the sauce using other berries, mangoes, peaches, plums or other fruits. Remove the skin of peaches, plums. Flavour the sauce with basil, mint, cinnamon, ginger etc.